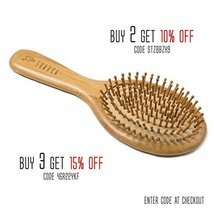 SHARCA Premium Wooden Bamboo Hair Brush with Ball Tipped Bristles from Natural Wood. Organic, Biodegradable, No plastic ? FOR THE HAIR YOU ALWAYS WANTED ? Are You in search of natural ways to boost hair growth, nourish your hair and treat yourself? 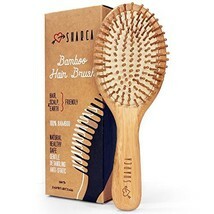 SHARCA BAMBOO HAIR BRUSH will help You achieve the healthy, shiny, voluminous hair that You dream of, by minimizing any pulling, breakage, static or frizz, promoting shine and strength, while treating your scalp and stimulating healthy growth. ? 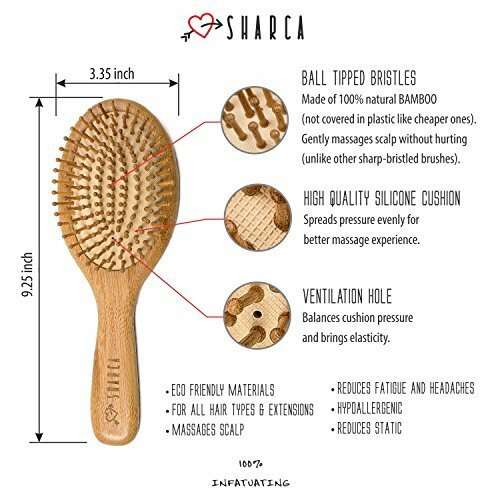 LOTS OF LOVE AND ZERO DAMAGE SHARCA BAMBOO HAIR BRUSH treats all hair types with kindness. It’s a must-have for long, thick, dry damaged hair. So incredibly gentle You can even use it on WET hair! 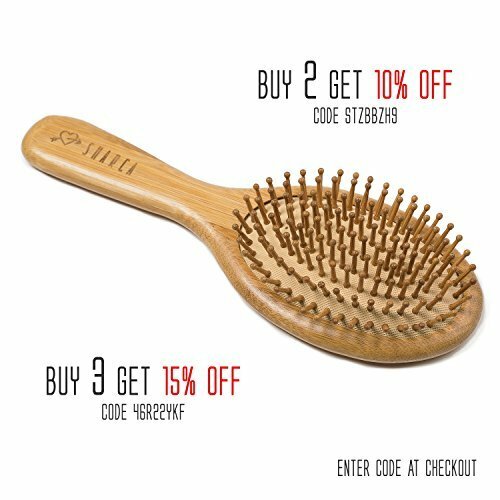 Due to the shape and smoothness of the bristles it makes a fantastic detangler brush. Great to use with hair extensions or wigs. Perfectly gentle hair brush for kids. Hair condition greatly depends on a healthy scalp. That’s why our maximizes scalp treatment. 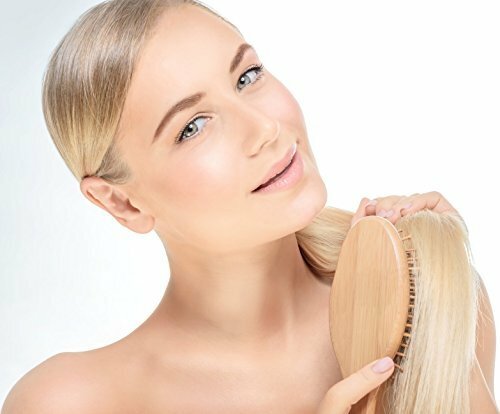 The round tips of the bristles provide a stimulating scalp massage. Increasing blood flow to the scalp helps nourish and activate hair follicles to increase growth, fight hair loss, treat dandruff and itchy scalp. And of course, gives great relaxation! ? GIFT IDEA Caring for someone is the greatest gift. Our quality product will make a treasured and lasting gift for the person You love. Great as a birthday present, Christmas present, Mother’s Day gift or Valentine’s day gift. ? 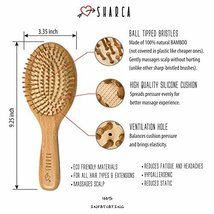 WHY SHARCA We make our products with love. We value Quality, Beauty, Knowledge and Nature above all else. 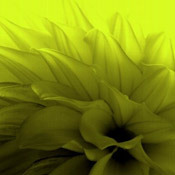 Together with our customers we work to keep this world the most beautiful and healthy place! And if You still wonder whether this is the right choice for You - try it and see risk free! We offer our 100% NO-QUESTIONS-ASKED MONEY BACK GUARANTEE for every customer. So ADD TO CART make a difference for Yourself and the Environment today! - ? ARE YOU READY TO FALL IN LOVE WITH YOUR HAIR? Improve the condition of your hair and scalp, grow longer healthier hair, naturally! Brushing is essential, so make it beneficial! 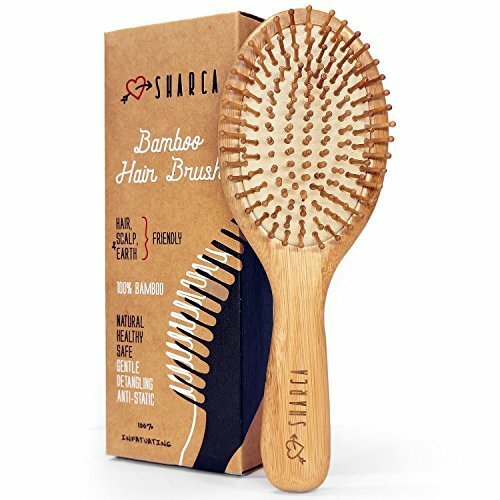 SHARCA BAMBOO HAIRBRUSH paddle comb will take Your hair care to the next level by minimizing any damage, pulling, breakage, static or frizz, promoting shine and strength! - ? EASIER AND MORE EFFECTIVE HAIR CARE. 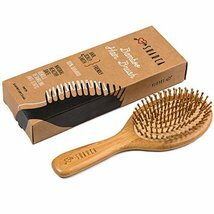 Bamboo durable bristles glide effortlessly through all types of hair: thin to thick, straight to curly, easily and gently smoothing long, wavy, dry or damaged hair. Gentle enough even for WET hair, extensions or wigs. - ? SCALP MASSAGE. Round tipped bristle pins will provide You with an invigorating scalp massage anytime You want. Scalp massages improve hair growth, prevent hair loss, dandruff, relieve stress and headaches. Looking good starts from feeling good! - ? ECO FRIENDLY. Bamboo wood is one of the most sustainable resources on Earth. Due to its expedient and resilient qualities and extremely fast growth it can be harvested without any impact on the environment! - ? INFATUATION GUARANTEED. We manufacture best quality products with our customers in mind, so we are sure You will fall in love with it! That's why we offer 100% NO QUESTIONS ASKED MONEY BACK GUARANTEE. Shop with confidence!